When I tried my first paintings on canvas it was because I found some canvases on sale. Normally I just use my acrylics to paint little wood boxes, plastic blasters and Jedi comlinks, little things like that. 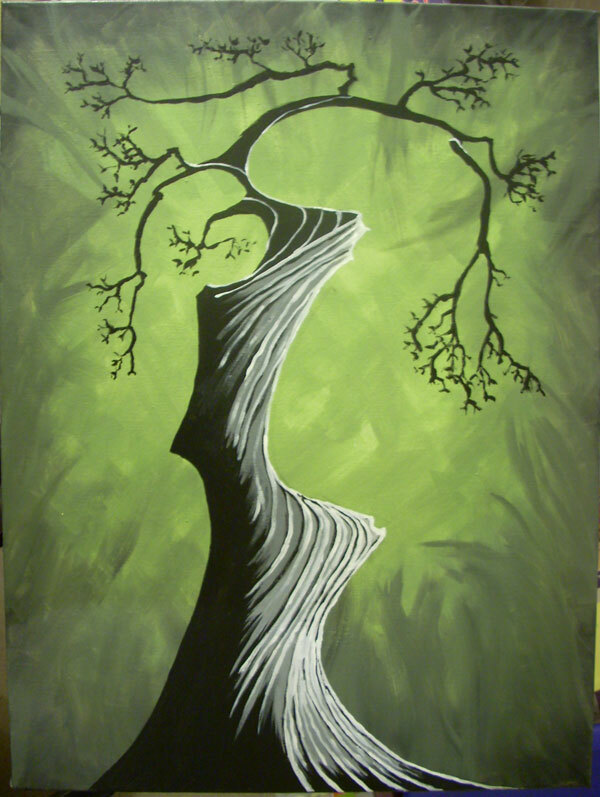 So for my first painting on actual canvas I decided to try and learn from one of my favorite artists, Eyvind Earle. I started painting the background and just layered on the green then mixed in some black and came in from the edges with strokes to look like grass or vines. After getting the background the way I wanted it and letting it dry, I found a picture of an Eyvind Earle painting online and basically tried to copy the look of the tree without getting quite as detailed. His lines are too painstakingly perfect for my amateur ability so I took a more impressionistic approach and focused more on getting the idea of the shadows and highlights conveyed. I like how it starts with a silhouette but adds the contrasting white highlights to give the tree some depth. I noticed that a lot of amateur artists are doing the black tree silhouette-on-a-colored background thing right now. It's easy and can look great in a modern room. I am still trying to figure out where to put it in my new house. I started this one by painting the background. I liked how subtle vertical stripes fading into the background color can look like trees in a fog, so I started with fat green vertical stripes blending into a yellow background and then painted over them with another layer of yellow. 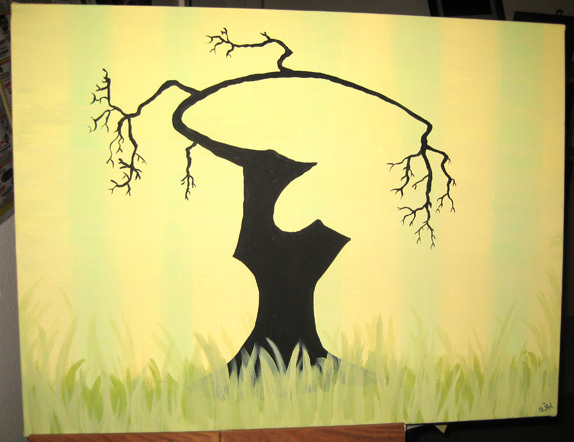 Next, I added in the grass in several layers of shades of green but decided that the grass really should be the foreground, so after painting on the tree silhouette I repainted a lot more grass over the bottom of the tree. The nice thing about painting grass this way is you can keep adding on as many layers as you want and it just gives the illusion of more depth. It's now hanging on the wall in my friend's home up in Victoria, BC!